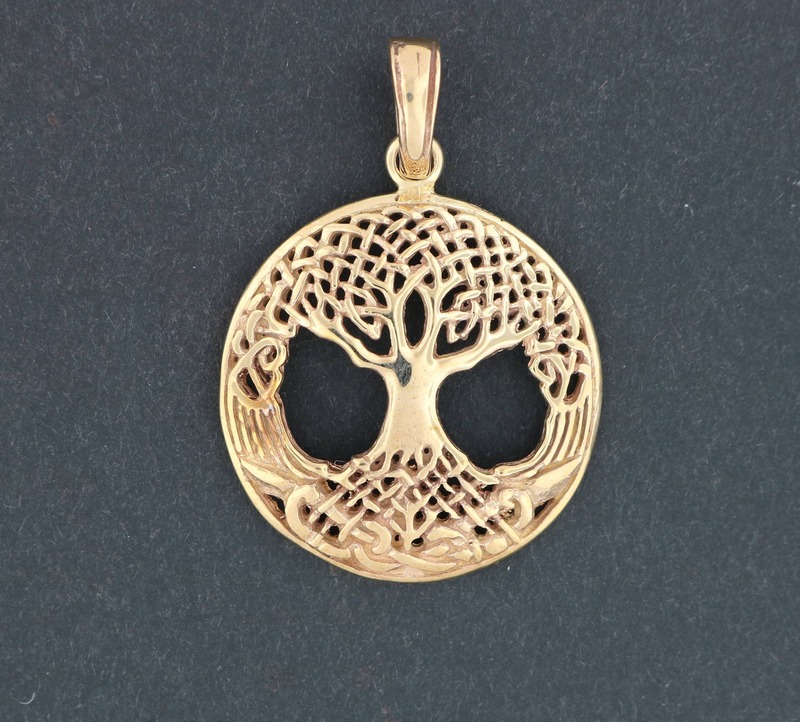 A popular design, this is a remake of a tree of life pendant based on the Yagersil. The Tree of Life from Norse mythology. The knot work in the branches make it so beautiful. The design is a production design I made a mold of to sell quality copies here in Montreal. Made in antique bronze, 90% copper and 10% tin, it measures 2.7cm wide and 3cm large plus a nice solid bail. The tree of knowledge, connecting to heaven and the underworld, and the tree of life, connecting all forms of creation, are both forms of the world tree or cosmic tree, according to the Encyclopædia Britannica, and are portrayed in various religions and philosophies as the same tree. The most famous is that of the Yggdrasil of norse mythology. Yggdrasil is the name of the tree of life in Norse mythology. Yggdrasil is an immense ash tree that is center to the cosmos and considered very holy. The gods go to Yggdrasil daily to assemble at their things. The branches of Yggdrasil extend far into the heavens, and the tree is supported by three roots that extend far away into other locations; one to the well Urðarbrunnr in the heavens, one to the spring Hvergelmir, and another to the well Mímisbrunnr. Creatures live within Yggdrasil, including the dragon Níðhöggr, an unnamed eagle, and the stags Dáinn, Dvalinn, Duneyrr and Duraþrór. Bronze is an alloy that consists of a mixture of approximately 90% copper and 10% tin. Producing bronze is a less toxic process than producing brass as brass is a combination of copper and zinc, and the manufacturing process often produces zinc oxide which is toxic. Because bronze contains copper, it can turn your skin green whether you have an allergy or not. Bronze and copper turn your skin green because when the copper reacts with your sweat and the acids from your skin, it produces copper chloride. Copper chloride is a green substance that then rubs off on your skin. If you are prone to sweating, your bronze jewelry will definitely turn your skin green. This chemical reaction can also be prevented by painting any part of the jewelry that comes in contact with your skin with clear nail polish or clear acrylic enamel. Beautiful design. Nicely made. Thanks!